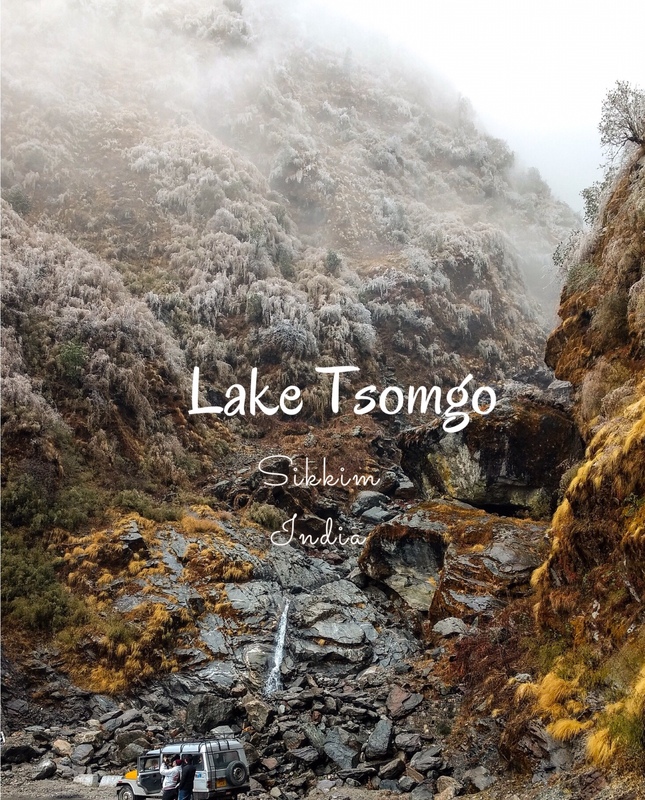 “Bad luck”, our tour guide told us shrugging his shoulders, when we weren’t given the permit to go beyond tsomgo (pronounced Changu in the local language) lake. Trip to Baba mandir and Nathula pass are clubbed together with Tsomgo lake as it is en route. He explained to us, that the combination of rain and below zero temperatures on that day, formed a slippery sheet of ice on the road which made it dangerous for vehicles to pass. There was little room for argument or negotiation, we quickly accepted the momentary set back and agreed to him. But little did we know that the trip just to tsomgo lake and back would leave us with an experience worth the time, money and effort and more! The road to the lake was steep and curvy, chiseled along the mountain surface. The journey took us 1.5 hours to cover 40 kms where we saw continually changing flora on one side that began with tall trees and bamboos gradually shrinking and turning into grass and wild plants; and an exorbitant trough on the other, rising up again as adjacent mountains. The gradual plummeting temperature was palpable as you ride up but i was reluctant to pull up the windows wanting the cold air to freeze my face making my nose go numb. We began to see droplets of water over wild plants having gone solidly static before their descent on land. These narrow roads have no civilization except for some army camps and small temples on the way up. A recent daunting incident was narrated by our driver on the way up, about a woman who accidentally slipped into the tsomgo lake while posing dangerously for a selfie even after being repeatedly warned. Such incidents make it hard for one to argue against deeming selfies under the radar by mental health professionals. Fortunately, the army was very prompt in rescuing her quickly. The locals say that people haven’t been able to measure the depth of this lake so far though it’s been documented to be 50 feet on the internet. The lake is elongated stretching for about a kilometer and oval in shape which the fog did not allow us to appreciate that day. Melting snow from the mountains adds to the water in the lake. While the lake remains frozen during winters, summers unveil lively blooms mainly rhododendrons around the lake. We were at an altitude of 12,400 feet above sea level. Once we reached and got off our vehicle, we stepped on thin sheets of ice on the ground formed from collected rain water having frozen which made it very slippery and hard to walk on. We stopped at a stall to have some hot tea and rented a pair of gloves as our finger tips began freezing. Warm jackets and other winter wear were available for rent here for those who were unprepared for the snow. The mountain above the lake was mostly covered in snow though there was a lot of fog making it hard to look far ahead. As we entered the lake over a metal bridge with prayer wheels on either sides, we could see many Yaks with their masters beside them waiting to be hired for Yak rides up the highland. I think your expedition would be incomplete if you don’t take home a picture on a Yak after having come here! The creatures are large yet timid. You can approach them from their head end but doing so from behind or beside them could make you a victim of their self-defensive kick, as their masters often warned us. The experience of walking on the snow cleared foggy paths circling the mountain over the lake; with Yaks passing by us every now and then, was exhilarating. The Yak rides, though expensive, would’ve been amazing if not for the narrow paths with steep slopes below with slippery ice. I must admit though, that it was sometimes a challenge albeit an adventurous one, walking through the threadlike trails when a Yak passed us by. We spent about two hours walking around till we got tired. Our drive back downhill from the lake was remarkable. We stopped our vehicle in a couple of spots just so we could watch the incredible views for a bit longer. The valleys so deep and the mountains so high, nothing like the mountain ranges of southern India. The mountains were covered with glazed shrubs and trees that looked like having come to life from a fairy tale. We stopped often to click as many pictures as possible. It was a memory I would cherish for life.